Is Termite Damage Covered by Your Homeowner’s Policy? Termites are some of the most destructive pests to threaten your home. They are non-stop eating machines. They will chew through the wood and other cellulose in your home’s beams, floors, walls, and ceilings all day, every day until there is nothing left to eat. Your house can literally collapse from damage caused by termite infestation. And, in some cases, you may not even know the termites are there until the damage is obvious – including your house actually collapsing. No sweat, though! That’s why you have homeowner’s insurance, right? Homeowner’s insurance is designed to protect your home against loss, paying for repairs when it is damaged. However, most policies only cover loss in the case of sudden or unexpected damage. While you may not have known that your house had termites and the damage is considered unexpected to you, your insurance company likely does not consider it unexpected and does not cover it. In fact, many insurance companies specifically exclude termite damage from their Chandler homeowner’s policies. As a homeowner, you are expected to invest in routine maintenance and care for your home. That includes getting regular pest inspections, including a specific termite inspection. You should also be getting regular treatments to keep these pests out of your home. If you get termites, it almost always means that you have neglected your maintenance duties. There are a few cases in which damage as a result of termites might be covered by your homeowner’s policy, depending on the specifics of the policy. For example, if your home is damaged by a hurricane or other big storm, you might get a lot of water and rot that attracts termites or that allows them inside. Your insurance policy might cover the cost of removing the termites and any additional damage that they cause in the time following the storm. Just don’t think that you’ll be able to pass off previous termite damage as caused by the storm! The experts will be able to assess the relative amount of time the termites have been present by how much damage has been caused. In some cases, your insurance policy may cover damages if your home completely collapses as a result of termite damage. The policy won’t cover damage to a few beams or even a whole floor, but if the whole house comes crashing down, you may be covered. That’s an extreme scenario that you shouldn’t wish for, but you may take some comfort in knowing that you might have comfort if the situation comes to pass. Finally, you may be covered for loss of some items if they are damaged from termite infestation in in Chandler, AZ. For example, if a beam falls down and breaks your computer, you may be covered for a new computer, but not for repairs to the beam. The best way to know exactly what coverage you have and in what situations is to talk with your homeowner’s insurance company to get the specifics. If you don’t have termite coverage – which you almost certainly don’t – you can discuss the possibility of a special policy that does cover it. If your company doesn’t offer it, other companies do. The best course of treatment for termites is prevention in Chandler Arizona. It is important that you schedule a yearly termite inspection for your home, as well as routine termite treatment to prevent infestation. How frequently you need an inspection or treatment will depend on your home and location, but you may need to schedule a visit every three months, six months, or a year. 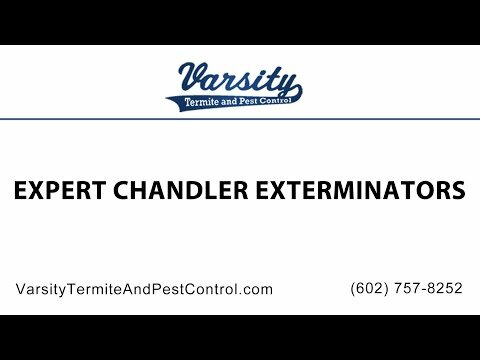 Varsity Termite and Pest Control performs termite inspections and termite control in Arizona, primarily in the Phoenix area. Our technicians can find termites even in the earliest stages of infestation. By detecting the termites early, we can come up with a termite treatment plan that will eradicate them and prevent new infestations from occurring. We develop a termite control plan that will minimize your risk of termite infestation and will quickly eradicate any pests that do take up residence. Our team is also skilled at detecting and eradicating other pests that are common in Arizona, including scorpions, ants, roof rats, and cockroaches. Call us today to schedule an inspection!